When I started publicly defending Israel in June of 2014, I became the object of the most depraved hate I’d ever encountered. I thought Jew-haters were the bottom of the barrel, but I was wrong. Times were not tough at all back then. Jew-haters have an excuse: They’re mostly alcoholics on welfare. My current attackers are politicians, pundits, professors, and people I thought were comrades in arms. But it doesn’t matter. Marco Rubio said in his concession speech tonight that when America doesn’t lead, it leaves behind a vacuum. That’s not true. Nature abhors a vacuum, so it’s already been filled. All we can do now is support. Which is as it should be. We don’t deserve a position of leadership. 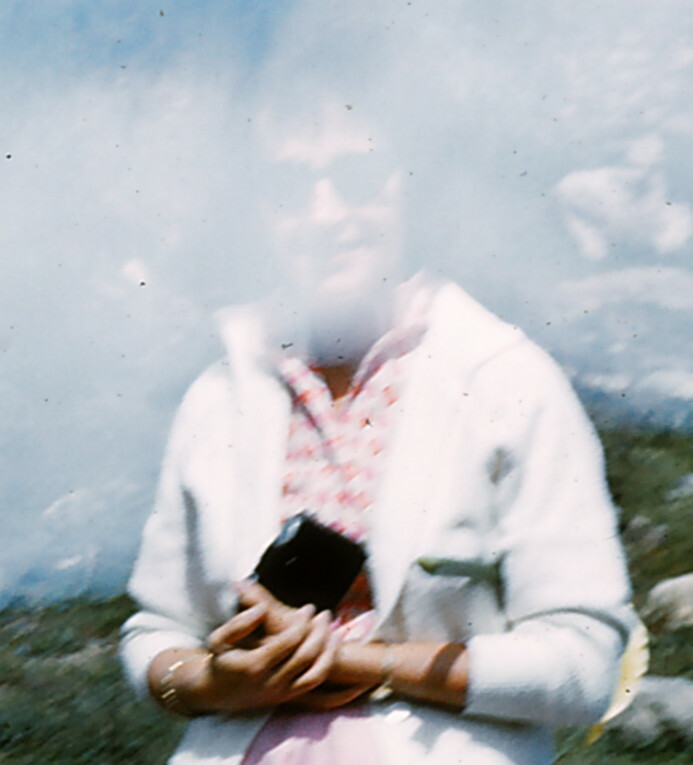 Last night I had a dream about my mother, CeeCee, who died October 13, 2013, at the age of 85. She refused to cooperate in her treatment for Stage IV peritoneal cancer and encapsulated lung cancer, so she died. Her death was the worst experience of my life, since she tried to change her mind at the last second and went out in panic, crying and screaming. This was after six months of my brother Tim and me begging her to live. I recently realized that I won’t recover from CeeCee’s death. After she died, I discovered the secret that she carried her entire adult life. It’s not anything a person can accommodate. In my dream, she wore a watermelon-colored velour track suit. She handed me a folded sheet of paper. As I opened it, she stood up and disappeared. In a moment, I’ll tell you what was written on the paper. I was once a military historian. 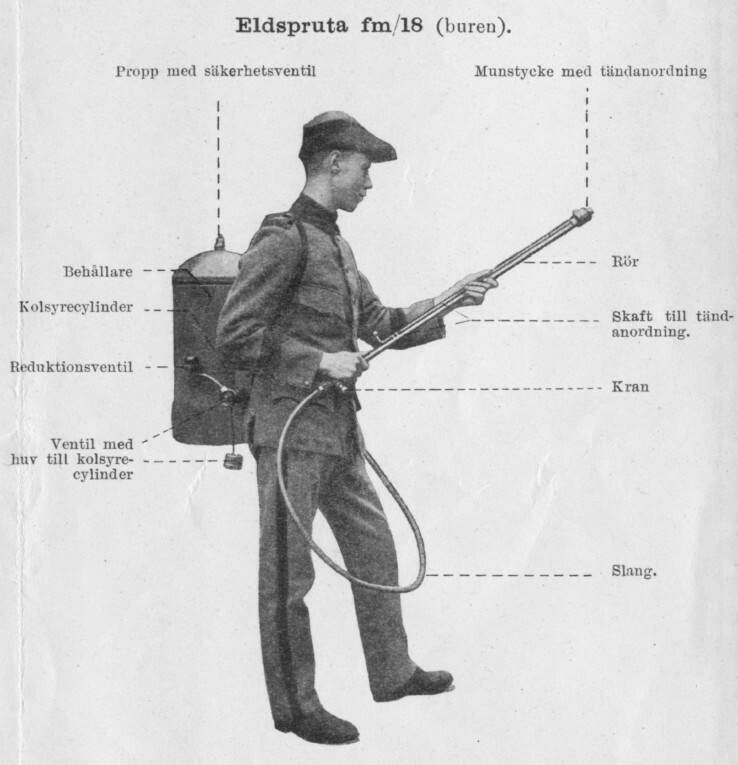 In fact I’m the planet’s only expert on World War I flamethrowers. 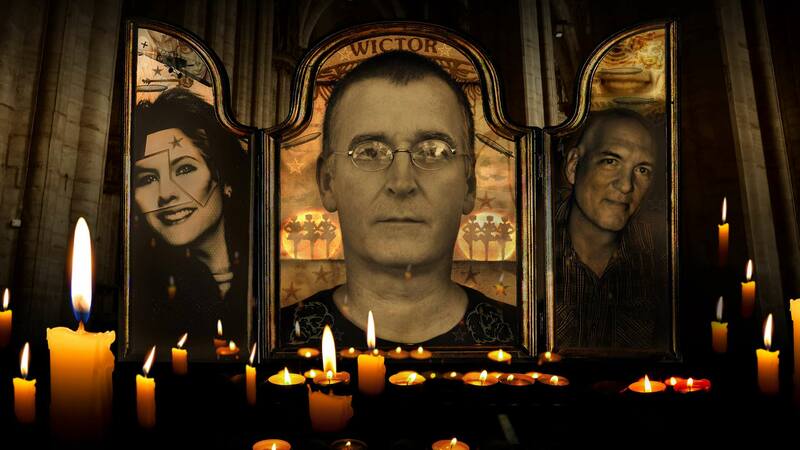 Though I published three books about them, I gave up writing because my ideas were utterly rejected. My goal was to add to the pool of knowledge, but since I have a heterodox mind, others in the field reacted with hostility that became rage. It’s happened many times. This morning on Twitter, I saw that “experts” on unmanned aerial vehicles (UAVs) were taking issue with my posts about the Syrian war. It was exactly like back in 2007. The people telling me that I’m wrong have no factual knowledge. They said that they didn’t need factual knowledge; it was my job to mount a convincing enough argument to persuade them that I’m right. These UAV “experts” didn’t know how the British Special Air Service (SAS) killed Mohammed Emwazi, alias Jihadi John. The daring mission began in darkness on November 11 when two US Chinook helicopters skimmed low across the Syrian desert to land at an isolated spot. Avoiding all roads, the team of soldiers drove in desert buggies 35 miles south towards Raqqa. At about 3am, they ‘dug in’ five miles outside the city, where they remained undetected. The following evening, while the rest of the team were on lookout, one man assembled four 3ft nano-helicopters with infrared and night-vision cameras in the nose. 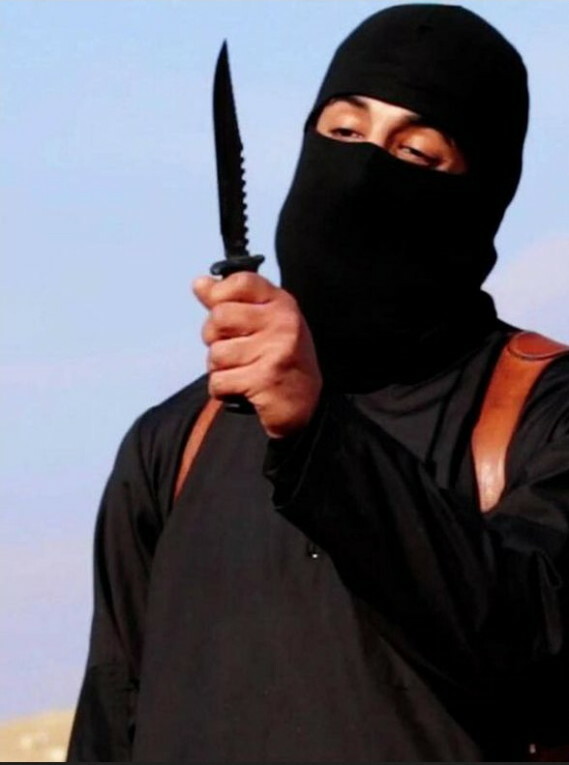 They were pre-programmed to fly to Jihadi John’s hideout – a six-storey building in Raqqa. The first drone set off towards its target, then entered ‘hover and stare’ mode, recording the movements of IS suspects at a building near the Sharksa mosque. Emwazi was identified with facial-recognition software, and after he got into a car, he was fed several Hellfire missiles. If you don’t know this, you’re not a UAV expert. But that didn’t stop the people on Twitter from calling me a conspiracy theorist and then making jokes about me believing in chem trails and reptilians. The reason we’ve become a failed culture is that there’s no shame in being an ignoramus or a fanatic ruled by idées fixe. Americans now pride themselves on their stupidity and rigidity. Times are hard for people who prize…normality. I read two pieces today arguing that the Republican party must destroy itself in a brokered convention in order to prevent Donald Trump from becoming president. The people advocating a brokered convention say they know that the party will lose in the general election and then splinter into fragments, but it’ll be worth it to save the country from Donald Trump. 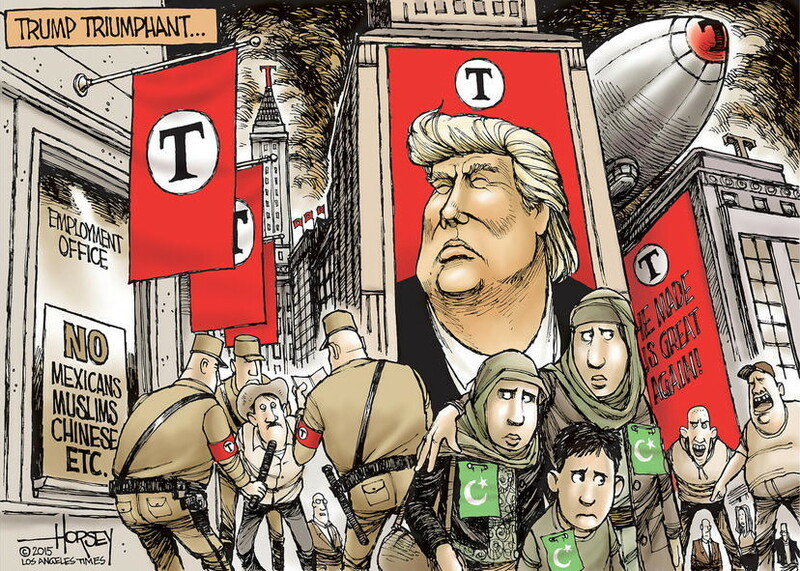 What’s Trumpism? Can you define it? Of course not. It doesn’t exist. Donald Trump has become the vehicle through which every lunatic expresses his or her pathology. Since June of 2014, I’ve defended Israelis, Yemenis, Kurds, and Saudis. I’ve received astonishingly vicious hate mail from all of those groups…except for the Saudis. But I knew that Saudis wouldn’t send me hate mail. For the record, I oppose halting Muslim immigration. That won’t address the issue of the terrorists already here. Besides, the remedial work we need to do in order to screen out terrorists is no longer possible. The rot is too deep. America will never be great again, because we don’t want to be. Maybe it’s because I was born in Venezuela, but I never believed in the notion of the US as the leader of the free world. We pay lip service to ideals that we don’t actually have. I do believe in American exceptionalism, but it was killed. Which brings me to the note that my mother gave me in the dream last night. Here’s what it said. The dying is filling the sun, yes. But as everything around me decays, I take comfort in the fact that the torch has been passed. A new center of rationality, technology, humaneness, skill, art, and achievement is rising. Russia wasn’t the only one to surrender in Syria yesterday. The Russian pullout seems to have been followed by the Hezbollah, the Lebanese Shia militant group. Hezbollah militia sources confirmed to a Lebanese website close to the group that hundreds of their members fighting alongside Assad’s forces in Syria have started since Monday afternoon to return to Lebanon without warning. 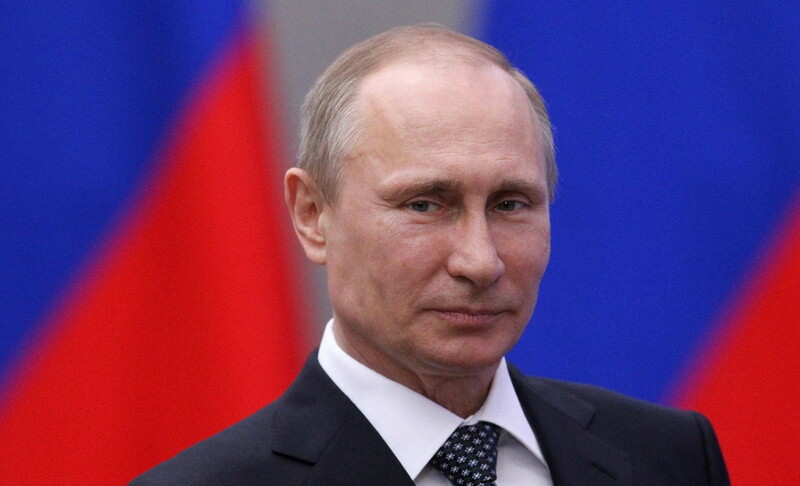 “Putin’s announcement of a ‘withdrawal’ from Syria is another brilliant move by Russia. Russia declared mission accomplished after six months demonstrating that Moscow seeks a full-blown diplomatic solution to the Syrian catastrophe,” he said. Russia and Hezbollah began fleeing Syria the same day that Putin announced his decision. That’s not a “brilliant move”; that’s called “a military shellacking.” Nobody withdraws forces without warning and in one day. This has no precedent. Russia and Hezbollah were chased from Syria within 24 hours. Not even NATO or the US could’ve achieved that. Guess who’s suddenly singing an entirely different tune? As a soprano? “The fact that Russia announced they are withdrawing part of its forces indicates that they don’t see an imminent need for resort to force in maintaining the ceasefire,” said Zarif during a visit to Australia on Tuesday, according to BBC Persian. It’s a positive sign that Russia surrendered in Syria? Who does he think he’s kidding? 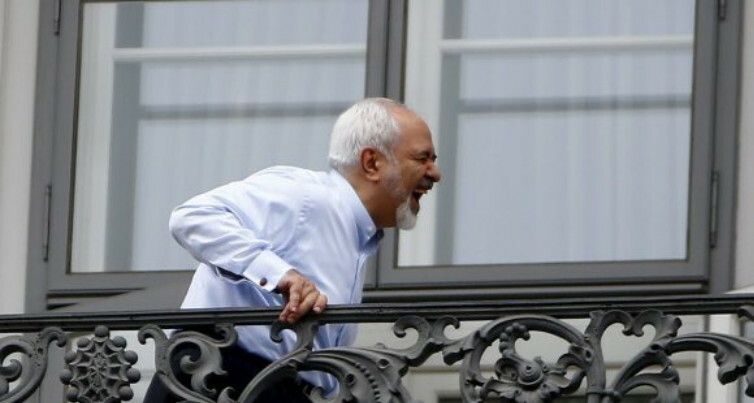 Here’s Zarif after the Iranian nuclear deal was…agreed upon, I think is the current terminology. Zarif is addicted to boasting about how thoroughly disreputable his government is. Mohammad Javad Zarif said in a speech at the Australian National University that Security Council Resolution 2231, which was adopted after the Iranian nuclear deal was signed last year, did not bar Iran from testing the type of nuclear-capable ballistic missiles that it launched last week. “It doesn’t call upon Iran not to test ballistic missiles, or ballistic missiles capable of delivering nuclear warheads. It calls upon Iran not to test ballistic missiles that were ‘designed’ to be capable,” Zarif said. Iran put a message on these ballistic missiles that were not designed to be capable of delivering nuclear warheads. Iran test-launched two ballistic missiles Wednesday emblazoned with the phrase “Israel must be wiped out” in Hebrew, Iranian media reported, in a show of power by the Shiite nation as U.S. Vice President Joe Biden’s visited Jerusalem. For the mullahs, a show of power is writing things on empty missiles. 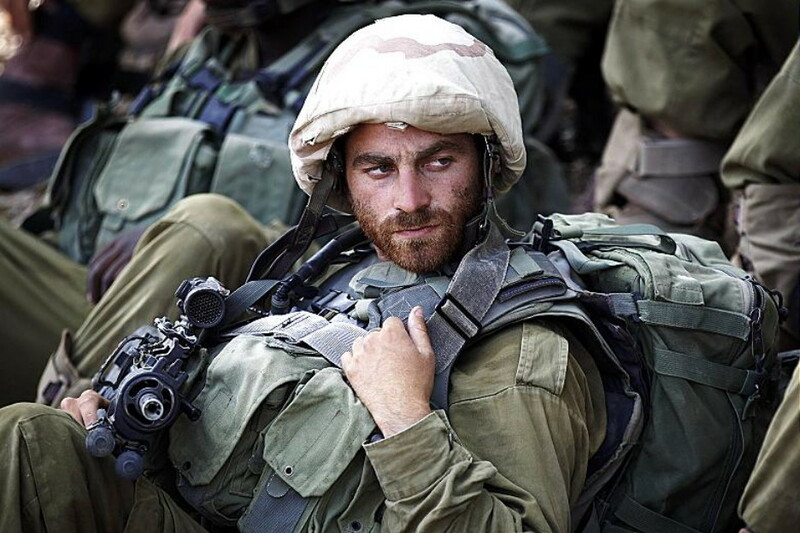 For Israel and the Arab League, a show of power is making Russia and Hezbollah flee Syria in one day. As I suspected, Iran is not reachable. Even as overall violence is greatly reduced, regime forces are openly bombing and in some cases launching ground operations to capture key rebel territory without making any pretense of attacking the Nusra Front. This behavior offers some insight into long-term regime plans, and highlights how little leverage outside powers including the United States will have in shaping the new status quo in Syria. The people still fighting are Iranian and Iranian proxies, not the Syrian Arab Army. These guys aren’t keeping up with the news. Hundreds of jubilant people spontaneously poured into the streets of the city of Taiz, southern Yemen, to celebrate breaking Al Houthis’ siege of the city even as troops were defusing a large number of landmines planted by the defeated militia, residents and government officials said on Sunday. 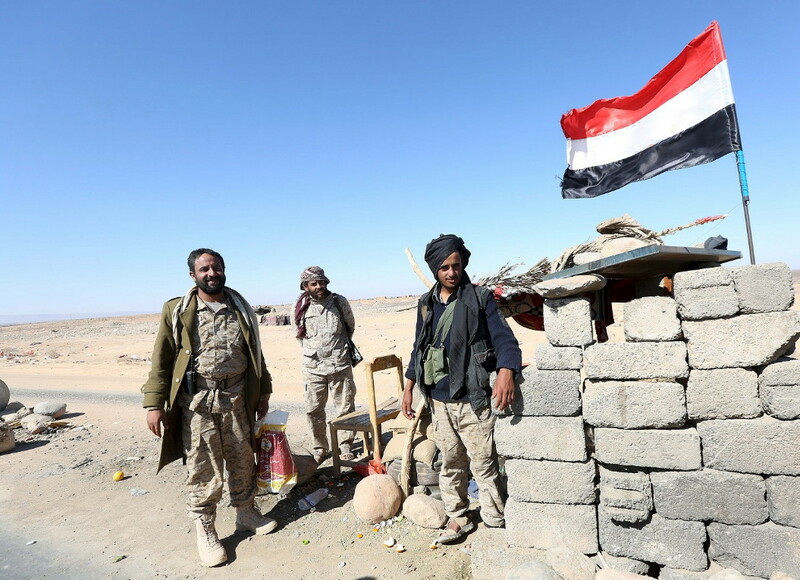 Houthis had surrounded the city with massive minefields and heavy artillery. They controlled all the roads and used hundreds of human shields in bunkers and other fortified positions. Booby traps were everywhere. The assault was expected to be a bloodbath. It took soldiers identified publicly as Yemenis one day to liberate Taiz, for a loss of twenty men. There’s no video of how they did it. 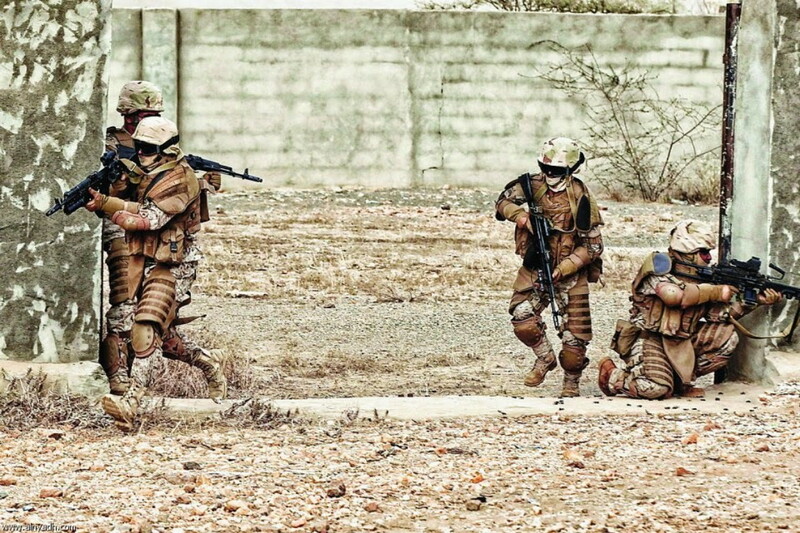 Reports are that they suddenly appeared in the city center, bypassing all the defenses. 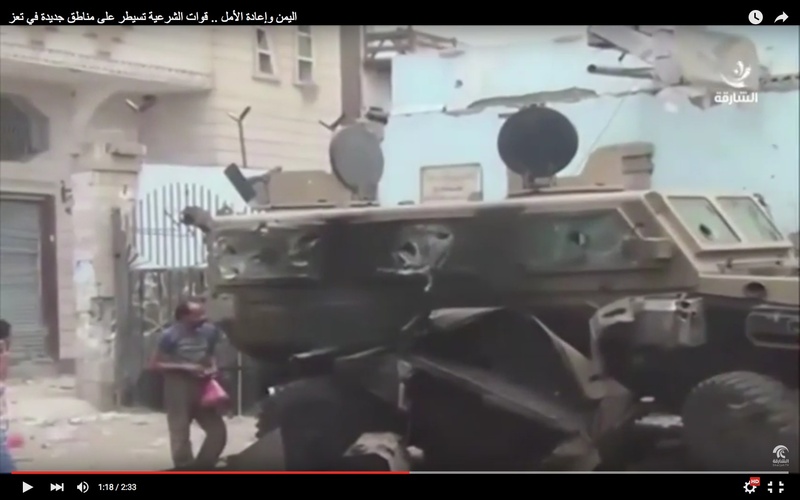 Here’s a Houthi or Saleh armored vehicle. It was raked with a heavy-caliber automatic cannon. I count eleven penetrations. Another new weapon was used: Below is the signature of a high-explosive antitank (HEAT) warhead. 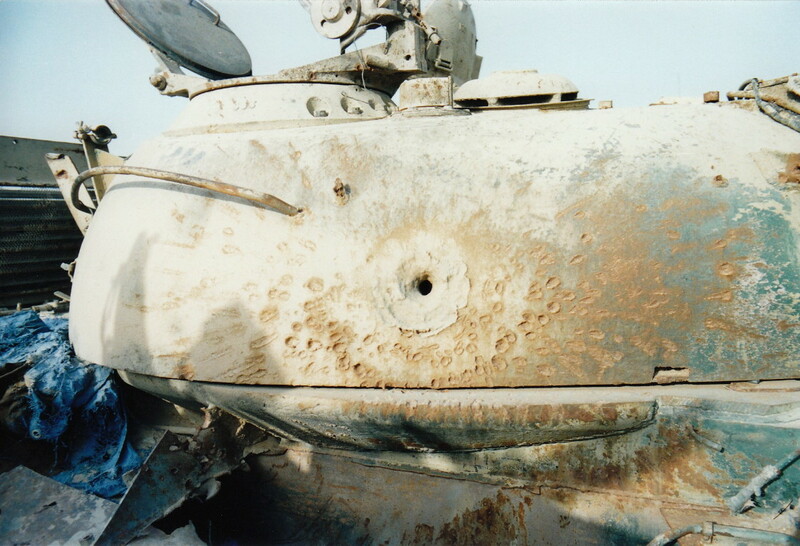 The rounds that hit the Houthi vehicle relied on kinetic rather than explosive energy to punch through the armor. Then the munitions detonated inside. No collateral damage, and no possibility of survival for the Houthis. It’s clear that the Saudis are making good on their promises. Saudi-led helicopters attacked Al-Qaeda militants in Aden in an effort to dislodge them from a stronghold in the southern port city, a security official said on Sunday. Witnesses and medics said Apache helicopters from the Saudi-led coalition struck armored vehicles and a government compound used by the militants in Al-Mansoura district, a stronghold in north Aden. Coalition aircraft provided support and hit a military convoy that was trying to bring reinforcements to the rebels, the sources said. While we melt down into a puddle of clown-goo, people much better than us are doing the hard work to improve the world. Israel will never be wiped off the map. However, the incurably destructive Iranian mullahs and their lackeys will be escorted from this plane of reality. The times call for it. This article viewed 390 times.